What would it cost if SAP would organize SAP Inside Tracks themselves? It usually is really tough to quantify in actual dollar amounts the impact of a thriving community on a company. Regarding events, you can calculate how much they would cost if not organized by the community. In this post, I am going to demonstrate that the 39 SAP Inside Tracks that were held in 2017 stretched SAP’s marketing event budget by a cool $1.9 Million. I say stretched because SAP would not spend that money but still gets the value. The SAP community team didn’t have a lot of budget, but we wanted to support these local events financially so that the organizers can at least invite everyone for a beer in a pub afterward. We earmarked $10K in our budget and gave out $500 to every event organizer. As these events are happening worldwide, it was a major headache to get the money into the organizer’s hands, but that story is for another post. It always felt to me like these were the best marketing event dollars ever spent. I remember wanting to calculate the dollars saved when I was nurturing these events but was talked out of it, as it would put a “bad light on my marketing colleagues” that organize traditional events and need so much more money. Recently I just got asked one too many times to quantify the impact that the community work has had on SAP so that I finally sat down and did it. Even I am surprised by the results. Worldwide active SAP Community members, mostly lead by the SAP Mentors created 39 SAP Inside Tracks in 2017. They are hugely popular, as the passion of the community members sharing their cool SAP projects/developments is absolutely contagious. At another Inside Track organizers would collect all participants’ car keys in the morning, to increase commitment during the day, but also surprise everyone with a freshly washed car when they came back to it in the evening. We can calculate how much it would cost SAP to organize these events themselves. They are usually full-day events drawing between 15-300 participants. 30 feels like a low average to base our calculations on. I created a worksheet for it and you can play with the numbers too. As you are usually not local, you have to travel to the location and stay at least the night before. Ideally, you leave the day after the event, to connect with the participants informally over a beer in the evening. These travel costs add up. As luck would have it, I met with Amit Sinha the other day. He used to run the marketing for SAP HANA. I told him about my event calculation worksheet, and he said: “I used to run these events for the original HANA rollout. I can tell you the true costs.”. For 30-150 people if the event was at a hotel the budget was $30K, if it was at an SAP location it would be $10K. He had dedicated people in his team doing these events and on average they would produce 10 events per year. I am blown away. The SAP Community organized SAP Inside Tracks have stretched the SAP marketing event budget by over $1.9 Million in 2017. If you go to an SAP organized marketing event, you have your guard up, you know you are going to be marketed to, aka they want to sell you something. To go to an SAP Inside Track is much more like a friends and family reunion where practitioners share the cool stuff they are doing with SAP. A totally different vibe. Check out Den Howlett reminiscing about the first true SAP Inside Track in London in 2009. SAP employees are embraced at these events and often present the latest developments from the mothership as well. For these SAP employees, it is the best way to get a pulse check about what is really going on out in the field and I highly recommend to go to and/or help organize at least one every year. Many of these Inside Tracks have spawned off monthly meetups called SAP Stammtisch. If I were an SAP executive, I would connect with the organizers and align my travel schedule to coincide with a local Stammtisch and pay the first round. Smart marketers work together with the Inside Track organizers like the SAPUI5 team did. 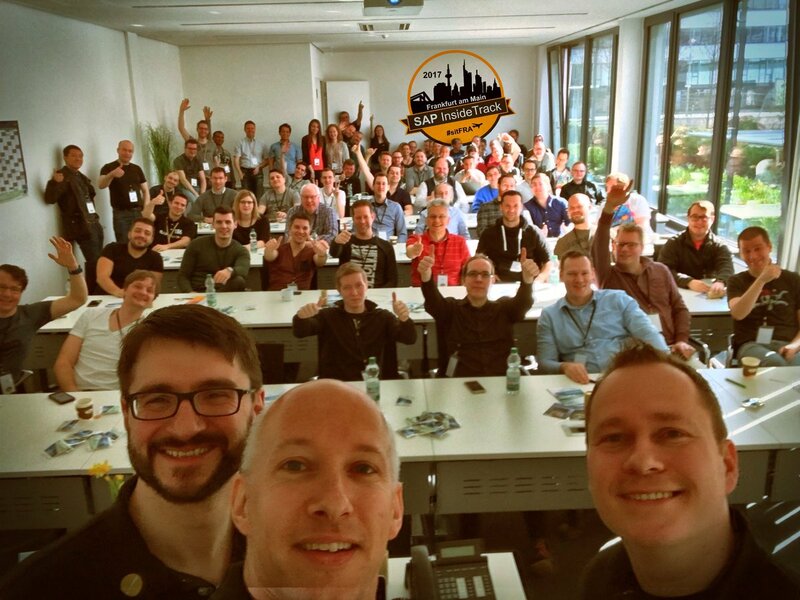 They put the UI5con the day before the SAP Inside Track in Frankfurt, both at the same location to great success. For me, these numbers are eye-opening and there is still enormous untapped potential in these Inside Tracks and I hope they will be nurtured even more going forward. That is amazing, thank you for compiling this information and sharing! The most relevant aspect of SAP Inside Tracks, in my opinion, is that you usually know you are going to have a “learning experience” instead of a “marketing experience”. As a SIT organizer myself I know that, as organizers, we take personal responsibility for communicating this “learning experience” approach to each speaker and attendee. I think it is what makes these events so valuable to the SAP Community. Ten years after that SAP Inside Track in London we are still learning from your experience. You write: As a SIT organizer myself I know that, as organizers, we take personal responsibility for communicating this “learning experience” approach to each speaker and attendee. I read your blog post and love how you focused on every role: Organizer, speaker, volunteer, participant and had diferent approaches to each. Very powerful. Is the “How-to-do an SAP Inside Track” still a wiki page? That insight would be great to captrue in it. Thanks for the great work you do, Mark. Thank you so much for your kind feedback. You are a great inspiration to me as someone who always made and still makes the SAP Community better and stronger! Yes, I had done my best to offer a good experience to organizers, speakers, volunteers, and participants knowing that each role demanded a proper approach. I have got the idea of how important it is after reading from Christian Braukmüller‘s experience with the SIT Frankfurt event organization. I will reach Christian to hear his ideas on how we could collaborate to put some ideas on the wiki page as you have suggested. Best wishes and thank you for the recognition and motivation! Thank you for sharing! Such a wonderful piece of information, especially the cost breakdown table! I love the idea of taking participants’ car keys as hostages! In fact, I’m organizing two SAP Inside Tracks this May, sitVAN and sitVANKIDS. I can’t agree more on amount of work required in putting together successful events. Thanks for sharing, Mark! Last year I organized a neighborhood ice cream social and oh boy, really don’t want to do that again. Can’t imagine the amount of work that goes into a SIT event. SAP is getting a great deal on those. The trick is, to have some co-organizers. That makes it much more doable and enjoyable. As you can see from the picture above Christian Braukmüller, Tobias Trapp and Hendrik Neumann is the team in Frankfurt, with help from the local SAP Stammtisch, as they write here.